Price: Select your card value below. Price will show once added to shopping cart. 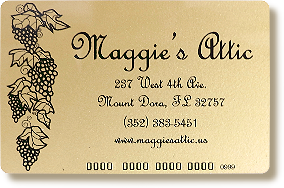 Maggie's Attic Retail Store gift cards never expire. You may purchase multiple gift cards in this session. If you purchase multiple cards at one time, please leave us a note during checkout process indicating to make these separate cards or merge the amounts into one card.